Forum Equity Partners Inc., one of the heavyweights of the private public partnership (P3) business with projects such as the tunnel linking Billy Bishop Airport to the Toronto mainland, has ambitious growth plans. “The U.S. is a different market in terms of its maturity – the Canadian market has become quite mature and stable as it relates to the P3 platform,” said Rupesh Amin, Forum Equity Partners’ managing partner of infrastructure development. “I think there is significant opportunity on the social side, in the water, ports and in the transit and transportation side. Forum, which has nearly two decades of experience, has more or less grown alongside Canada’s fast-growing P3 sector and is looking to replicate that pattern in the States. Canada can lay claim to international leadership in the case of P3 projects. And Amin, who has an Ontario government background, noted Canada’s biggest province is also its undisputed P3 leader. “Canada, and particularly Ontario over the last eight to 10 years, has successfully completed more P3 transactions than any other province, state or country,” he said. Amin joined Forum Equity Partners in the fall of 2011. Prior to that, he was vice-president of infrastructure development with another P3 player, Carillion Canada Inc. He earned his P3 chops with the Ontario government where he was part of the team that helped start up Infrastructure Ontario and then over the next four years helped take it to a steady state in his role as project manager. P3 players such as Forum Equity Partners typically learn about these opportunities through their development and construction partners, governments and government agencies that put out a call for investment. “There is a strong, healthy pipeline that most of the provinces in Canada will identify,” Amin said. 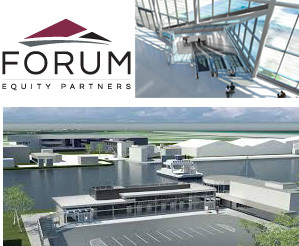 Currently, Forum Equity Partners is invested in developments ranging from tunnels to prisons and courthouses, arts centres, student accommodations and social housing, and is geographically positioned beyond its Ontario base to the Maritimes and the West. Forum Equity Partners is also eyeing emerging areas such as water, wastewater and bio-solids treatment. “We are already pursuing projects in that space and I think we are going to see more because there is an infrastructure deficit,” Amin said. Essentially, demand for services from municipalities is on the rise and funds to finance operations and upgrades are an issue. Beyond the provinces and municipalities, Amin sees plenty of opportunity from the federal government, with possible investments ranging from data centres to military housing. Finally, there are transit-related P3 projects that could arise in areas such as light rail transit, roads, bridges, and, of course, more tunnels. Forum Equity Partners’ most notable project is likely the Billy Bishop pedestrian tunnel. Scheduled for completion in 2015, it will be the world’s first underwater pedestrian tunnel connecting to an airport. It was procured by the Toronto Port Authority as a public-private partnership structured as a design-build-finance-maintain project, with a 20-year concession extending to 2034. Forum acted as lead developer, with PCL Construction as design-builder, Johnson Controls as facility manager and Arup as the lead designer. This month, Forum announced the closing of its acquisition of Brookfield Infrastructure Partners L.P.’s interests and asset management rights for the Surrey Pretrial Services Centre Expansion and the Quinte Consolidated Courthouse projects. The two projects, which have a capital cost of approximately $200 million, are part of the company’s expansion into the justice area. The Surrey Pretrial Services Centre Expansion Project is a 139,930-square foot correctional facility that connects with an existing pre-trial centre, making it the largest correctional facility in British Columbia. The state-of-the-art project is designed and built to achieve LEED Gold certification; it houses 216 high-security inmate cells and features renovations to the existing 149-cell pre-trial centre. The Quinte Consolidated Courthouse, located in downtown Belleville, Ont., is a 171,446-sq.-ft., six-storey complex that promises to rejuvenate the city’s newly defined courthouse district. The project achieved LEED Gold standard and includes 10 courtrooms, one motions room and five conference suites, as well as parking for up to 275 vehicles. Morguard is a joint-venture partner on the project.